Power Block is a quick-drying, high-performance coating specifically designed for prime stained or water damaged surfaces. 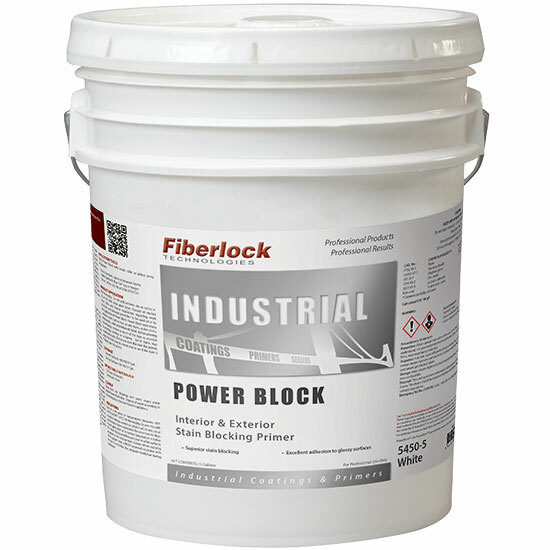 Power Block can be used on interior or exterior surfaces to prevent most bleeding type stains, seal porous surfaces and provide adhesion to hard and glossy surfaces. Surfaces to be primed must be sound, clean, dry and free of rust, grease, oil, mildew, loose paint, or any surface contaminants. Wash glue size off plaster or other surfaces from which wallpaper has been removed. Do not apply over calcimine, casein or other water-soluble paints. Fill nicks, holes and voids with appropriate patching material, sand smooth and HEPA vacuum dust. New plaster and masonry surfaces must be fully cured before priming. Sanding is not required for properly and thoroughly cleaned hard or glossy surfaces, but abrasion of the surface will increase adhesion of this product. Do not sand plaster until after the surface is primed. Tape joints on sheetrock should be sanded smooth, with care being exercised not to abrade the surrounding paper backing. Wire brush rusted areas to remove loose rust. Plasticizers must be thoroughly removed from vinyl wall coverings with mineral spirits and a clean cloth that is changed frequently. Consult all related local, state and federal regulations regarding work practices and personal protection to be used prior to the application of Power Block. Power Block seals many common stains such as rust, smoke stains, water stains, greasy spots, cedar and redwood bleed. Before priming stained areas, remove as much of the stain as possible by washing, sanding or scraping. Some stains may require two coats. If an active stain discolors this primer, apply the finish coat to a small area to see if the stain is “locked” into the primer. Clean tools and drippings with warm soapy water before Power Block dries. Dispose of all waste according to all existing local, state and federal regulations. Store in a dry place at temperatures between 40°F (4.5°C) and 90°F. (32°C). Stir thoroughly. Do not mix with any other coatings, solvents or colors in oil. Do not use as a finish coat or leave unprotected for more than 60 days. Do not apply when air or surface temperature is below 50°F, when drying conditions are poor or when surfaces are above a 15% moisture level content. When applying with a sprayer, wear a NIOSH approved respirator with any R, P, N or HE filter. Use adequate ventilation during application.